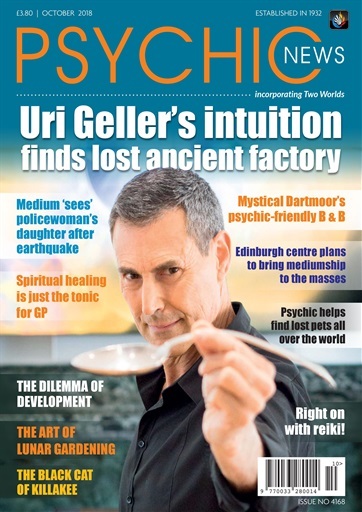 Inside the October 2018 issue of Psychic News, we share the incredible story of how Uri Geller’s intuition found a lost ancient factory underneath his new museum. Editor Tony Ortzen comments on the latest discovery in animal sentience, a million-in-one chance involving a carrot!, scientists are now discovering how life after death works, and how a timely letter by Lord Dowding reached far more than expected at auction. We share how a Devon psychic finds missing pets all over world, and report on Tony Stockwell’s new position as a trustee to the Sir Arthur Conan Doyle Centre in Edinburgh, and the centre’s new plan to bring ‘mediumship to the masses’. Fancy a holiday on mystical Dartmoor? Well, we’ve uncovered just the place to stay – a psychic-friendly B & B. This month’s editor’s interview is with Sheelagh Donnelly, a GP who is also a qualified spiritual healer and aromatherapist. We have exciting features on reiki healing, using lunar law for gardening, and Billy Roberts on the dilemma of development. We bring you the latest book releases in the mind body spirit world, and you have the chance to win one of ten copies of Chrissie Astell’s Guardian Angel Oracle decks in our monthly Sudoku competition.